It doesn’t bother me to call her that because she was mine. My first horse. And I named her Bay. Not the most creative name but she didn’t hold it against me. On nights like this, when the weather is frigid, thoughts of her pop into my mind. I’m not sure why. Maybe its because my favorite photos of her were taken in the snow. Or the memories of riding her in belly-deep snow in Maine. Or that it was the extreme cold, combined with heavy arthritis that finally took her. This may sound like a sad post, but I assure you it is not. She lived a good long life. Nearly 30 years. She taught me so much. And if it takes a wintery blast to remind me of her…then bring on the cold. Beautiful ! I have a guy here at our farm, that is gonna be 40 in the spring! You gotta love the old ones, and all they have been thru. He’s been here on our farm since he was 5 years old. While i’m commenting i just wanted to say that I’m often showing people your video that you did tackless many years ago to Tim McGraw’s LIVE LIKE YOU WERE DYING . It’s the BEST !!! Stacy, I loved the story. Although I have lived in the deep South most of my life, I did live a short while in Newfoundland, Canada. I believe Maine winters are more brutal than those. To me, anything that reminds me of a precious memory of a dog, cat, or horse is a good thing. 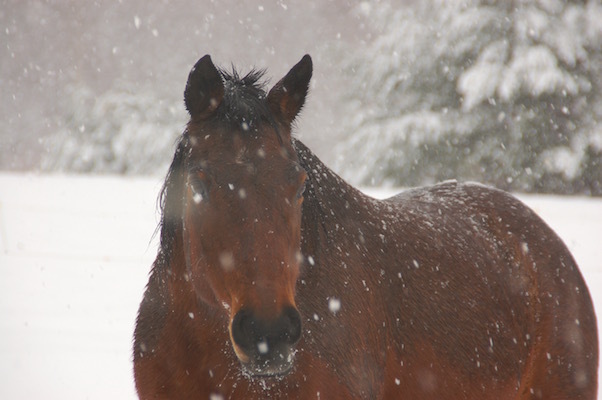 I do remember a few times when it would snow in Montgomery, Alabama, my horse would be astounded and run about, bucking, kicking, snorting at the white flakes. Actually they seemed to truly enjoy the challenge of it all. Now I live even further south on the Gulf Coast area of Alabama. It has been very cold here the past week. Below freezing every night for a week…now before you laugh, that is unusual weather for this part of the world. Having to blanket the horses, and even leaving the blanket on for several days has them frustrated and us too. But praise the Lord, normal is coming back beginning tomorrow. Highs in the 50’s – 60’s and lows in the high 30’s – 40’s. No frozen water troughs, no pouring water on everything to make sure the horses stay hydrated. They have sounded like pigs at a feeding trough this week, but it has worked, no colic. Stay warm up there. Our winters are great, but cry for us in the high heat and thick humidity from July through September. Not to mention always on the lookout for possible hurricanes. Life and weather….they go together. God bless you all. She looks like a beautiful strong lady. I pray every night I have my guy to a ripe old age.